Anti-bullying week: How Has The Internet Changed Bullying Over The Years? This year, anti-bullying week takes place in England from 16th-20th November. 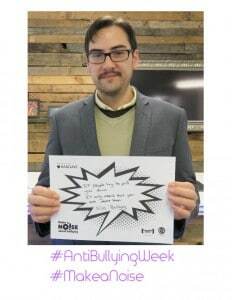 It is an annual initiative by the Anti-bullying Alliance which aims to make people aware of the statistics around bullying and to encourage children and young people to speak up about it. Whether it is done face to face or via the internet, bullying can have detrimental impacts on a child or young person’s self esteem and mental health. As we all know, technology can be really powerful when used as a source for good. Unfortunately developments in new technologies over the past few years have also contributed to a significant rise in online bullying. Things such as mobile phones with cameras, social networking sites and instant messaging apps are great because they make the life of the online user so much easier, however they can also play a significant part in cyberbullying. In the latest National Bullying Survey 56% of young people said they have seen others be bullied online. 42% of young people have felt unsafe online. 47% of young people said that they have received nasty comments on their social media profiles. 62% have been sent nasty private messages via smartphone apps. 91% of young people who have reported cyberbullying feel that no action has been taken. Harassment – The act of sending offensive, rude and insulting messages online, including using explicit language. Denigration – When someone may send information about somebody else that is false and damaging. This could include sharing photos of somebody in order to ridicule or spread rumours. Impersonation – The act of hacking into an email address or social profile and using that person’s online identity to send or post vicious or embarrassing material to/about others. Outing and trickery – When someone may share personal information about another or trick them into revealing personal details and forward them on to other people. This can also include private photos or videos. Cyber Stalking – The act of repeatedly sending messages which are threatening or intimidating in nature. Exclusion – When others intentionally leave individuals out of a group such as an instant messaging group, a social media app or a gaming site. Mobile use has now become a way of life, rather than just a behaviour. We are able to act on impulse and turn to our mobile devices with a particular intent at any opportunity we get. This means that our online experience is fractured into lots of moments throughout the day. Unfortunately this means that cyberbullying has been able to become a much more spontaneous thing too. Thanks to the anonymity that the internet provides us with, bullies are now able to hide behind the screen. One of the greatest things about the internet is the global reach that it allows an individual to have. However, the curse of this is that whatever you post online can be seen by a large volume of people, very quickly. It can also be difficult to ever take back information or permanently erase something once it has been shared online. This means that bullying can now happen 24 hours a day, 7 days a week, and can go viral very quickly. Please remember that it is against the law in the UK to use the phone system, which includes the internet, to cause alarm or distress. It could also be against the 1997 Harassment Act. So anybody who makes threats to you on the internet could be committing a criminal offence. For more information about cyberbullying and advice about how to deal with it, click here.